It feels very strange to be back at work the day after Christmas. In fact, I can’t remember the last time I worked following this holiday. I’d venture to guess it’s been at least ten years. Were we really gathered around the tree just 24 hours ago, sipping coffee, about to tear into presents? And enjoying a holiday dinner of roast beef, mashed potatoes, green beans, and cheesecake a mere 15 hours ago? How can I work, with those memories fresh in my mind? But work I must, because – continuing with the “hours” theme – in 48 of them, Tara and I will already be driving through the mountains of eastern Oregon, on our way to Nevada for a week of fun and relaxation. Gotta get as much done between now and then as I possibly can. Christmas was awesome, in a low-key way this year. There was good food, good company, a gorgeous sunset on the 24th, and I got to see my kids. My 95 y/o grandmother even took a sip of wine. Can’t ask for a whole lot more than that. I mean, a little snow would have been nice, but hell, we can’t even get rain these days. 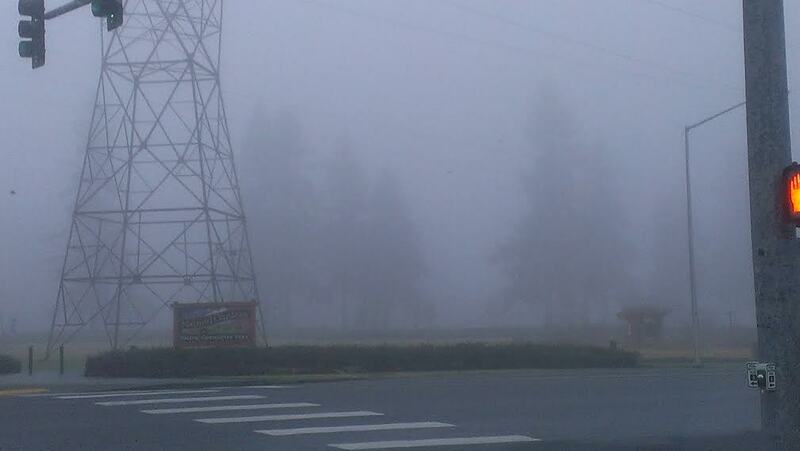 We’ve had nonstop fog for what feels like weeks on end. Most of the ski resorts haven’t been able to open because this winter is turning into one big, dry bummer. If that doesn’t change soon, we’ll be looking at water shortages next summer. Yes, in the Pacific Northwest. It almost seems laughable, huh? This has been our constant weather for weeks now. Speaking of looking ahead, at any given time Tara and I have at least tentative, if not solid, plans a year out. We were already planning next Christmas before this one even arrived. I can tell you what we’re doing over Memorial Day weekend (Sacramento for a wedding), shortly after Labor Day (road trip to the Black Hills and Yellowstone), and probably most every weekend in between (camping, Mississippi Street Fair, maybe even a quick jaunt to a middle-of-nowhere town in Wisconsin to crash a family reunion). Then there are other events planned – a weekend in Baker City, another in Spokane, a seaside trailer resort in Washington, a trip to Mount Rainier – where we just have to plug in dates. Hell, I’m hoping we can take an Alaskan cruise in 2015 and hit Europe in 2016. Tara and I are both planners who love traveling. It’s a match made in heaven. It sure sounds like 2014 will be another hectic year, but I think without the burden of our daily food challenge, and not having a wedding to plan, it should be a more relaxing year. Of course, we still have a townhouse to sell and a big move to make, but hopefully that will go quickly and smoothly. Is it unusual to plan that far in advance? Do you know what you’ll be doing next summer, or in 2-3 years? It’ll be a busy week, but lots of fun. We’re taking my AWD vehicle in the event we do run into some snow, but I’m not holding out much hope. Spotting a ghost, on the other hand? 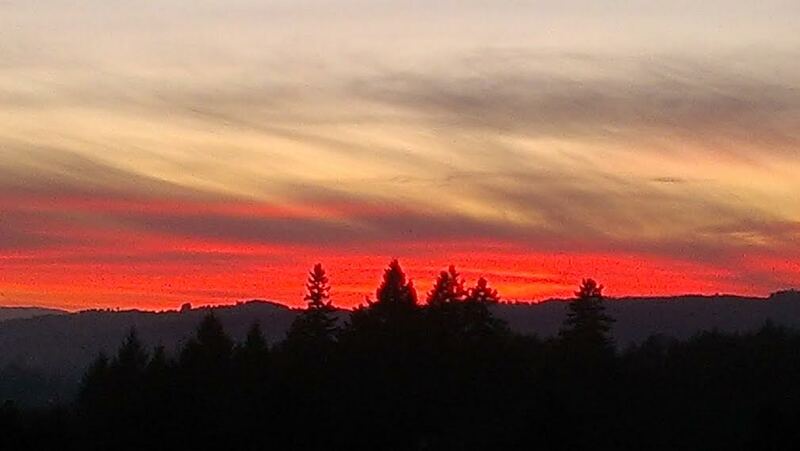 Spectacular sunset over Newberg, OR Christmas Eve. I don’t make plans that much in advance because quite frankly, I don’t know where the Good Lord will lead me next year. I may end up in Haiti doing missionary work. You just never know but I’m not worried. Whatever He has planned, it will truly be Glorious!! The Seattle trips go without saying! We’ll be up there in February. And the beginning of April. And…well, on and on. Unless you do end up in Haiti, in which case, we might have to scale back our every-other-month visits. First blog theme I’ve paid for, but I’ve had my eye on it awhile and it’s got everything I wanted. Resolutions are every bit as good as plans. They leave you with goals, and help set you on the right path. Good luck with yours! Same here, Mark. I never left my apartment yesterday, and watched Christmas movies, ate, napped, and just chilled. It’s was faaaaaabulous! Speaking of snow, we got some Christmas eve, but it didn’t last long. However, it snowed again this morning but last long as well. I’m dying to get some REALLY great snow this year. I think it’s awesome that you and Tara have your year planned out to where you want to travel to. Like you, I enjoy traveling. And I love, love, love your new blog template! The header is PERFECT! I read in your comment above that this is the first one you’ve ever paid for. Funny, because I’m going to be doing the same thing this new year. I found a website designer who is terrific, and I’ve already contacted her about purchasing one of her templates. I will most likely be doing it in January when I’m off. Have a super time in Nevada! Happy New Year to you and Tara! For a LOOONG time I’ve wanted this theme, but simply couldn’t justify paying money when there are so many free themes available on WP. But none of them spoke to me in the same way. Plus, I figure, this way my blog is even more unique and should stand out from the crowd a little better. The one-time fee is worth it to me. Can’t wait to see yours! Have a Happy New Year yourself! Hope you get some more snow! I want to go on your adventures too! They sound so fun! Yellowstone and a haunted hotel!!! I’m totally jelly. Worth being booked solid for. Definitely. Bon voyage…for the next 2 years! We just watched the Ghost Adventures episode featuring the Mizpah Hotel, where we’re staying. I’m even more stoked now. And yes, I’ve got my own ghost hunting equipment. I may not sleep a wink that night, but it’ll be worth it!! All of your trips sound fabulous! We love the west and would travel more that way if it didn’t necessitate a flight. Happy New a Year! I’m stopping by from Ron and Shae’s blogs. I’ve never been the world’s most comfortable flier, but I realized a couple of years ago that sometimes it’s the quickest, most efficient, and ONLY way to see the world. Depending on which part of the world you want to see, of course! Thanks for stopping by. Ron’s a pretty awesome guy! Not much of a planner here except a vague – we should try to get to Wpg. in April for Auntie Olga’s 90th birthday kind of thing. Not much travelling here – I’ve become even more housebound now with my COPD diagnosis. Well, that still counts as planning! Happy birthday to Auntie Olga, by the way. Long may she persevere. Happy New Year to you and Tara from Miami. And we wish you a Happy New Year from beautiful, frosty Ely, Nevada! Yeah, but I feel bad for those folks whose family reunion we’re talking about crashing.